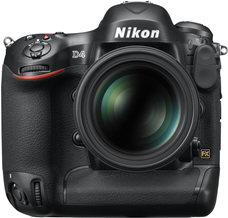 TOKYO - Nikon Corporation is pleased to announce the release of the Nikon D4, a Nikon FX-format camera that serves as the new flagship model in Nikon's lineup of digital-SLR cameras. Nikon will be exhibiting the D4 at the 2012 International CES, to be held Tuesday, January 10 through Friday, January 13 in Las Vegas, Nevada. This electronics exhibition is open to the public.